Inflatable bolsters are an integral part of our chambers. These bolsters are inflated with the same compressor used to inflate the chamber. The bolsters can be easily deflated for storage or transport. We have selected one of the most secure buckles on the market to ensure your safety and comfort. These metal buckles are designed for strength, safety, and ease of use. The activated carbon filter traps chemicals, gases, and odors, including volatile organic compounds, improving the air quality inside the chamber. It also makes the compressor cooler and quieter. Our patented, ultra quiet, oil-less pumps provide sound suppression, which permits a restful and relaxing dive. These highly compact motors are designed for continuous operation, providing you with a long lasting solution to your hyperbaric pressurization needs. With their small footprint, these compressors are easy to transport, and will easily integrate with your home or clinic environment. The 40" vertical chamber comes with carpeted flooring. The anti-microbial carpet is durable, child friendly, and easy to clean. This specially designed carpet inhibits the growth of mold, mildew, and bacteria naturally. We have designed this lightweight, durable plastic frame to prevent exposure to metals and toxins. The frame can be easily assembled and disassembled so that your chamber can travel with you. This foldable, compact mattress is made with an easy to clean surface. The mattress is both comfortable and versatile, and is easy to transport. This is an industry leading gauge, providing highly accurate readings of your chamber pressure to ensure safe operation. This gauge is so sensitive that it can measure individual millibars, which are a fraction of a PSI. The chamber is made from a very strong, highly translucent white urethane coated nylon material that provides for an extremely bright ambiance inside the chamber. You can easily read or relax inside the chamber using only standard room lighting. 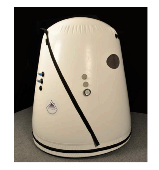 The 23" chamber has one inflation valve, one auxiliary valve, three pressure release valves, and a dump valve. 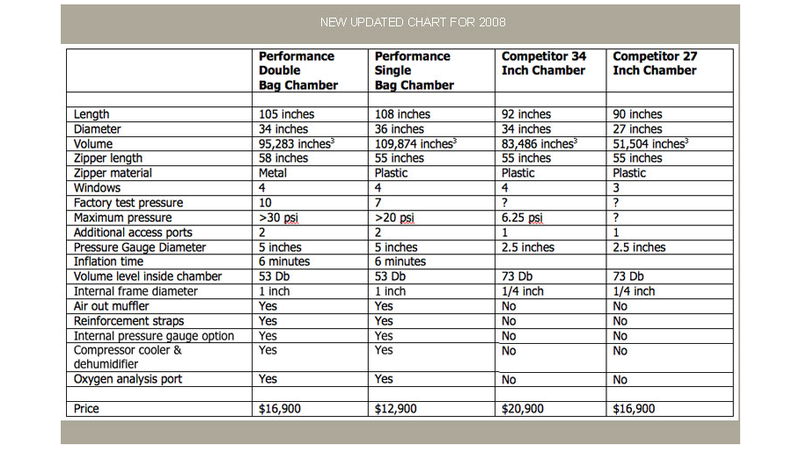 The 28" chamber has two inflation valves, two auxiliary valves, three pressure release valves, and a dump valve. The 40" chamber and the 40" vertical chambers have two inflation valves, two auxiliary valves, four pressure release valves, and a dump valve. This combination of valves ensures the safe operation of the chambers. These valves give the occupant of the chamber the ability to control the rate of compression and decompression. External devices such as oxygen concentrators can be connected to the chamber using these valves. The triple layer windows are comprised of a firm acrylic layer sandwiched between two vinyl layers, ensuring a tight, long lasting seal. The air tight zipper securely seals the air pressure inside the chamber, without the need of massaging or manipulating the seal. The internal air tight zipper is coupled with a heavy duty external zipper to ensure the integrity of the seal. The double sided zipper can easily be operated from inside the chamber. With over 25 years of experience manufacturing hyperbaric chambers, our team of experts have gained the experience and knowledge to produce high quality products that will meet your needs today, tomorrow, and in the future, at a price that is affordable! !